Order this 2 Layer Heart Shape Designer Cake filled with mixed chops and layered with Fresh cream, for someone special on any special occasion. -Guarantee to melt your heart with it's taste. 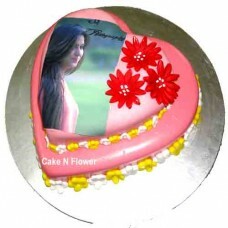 Make the celebration a grand ...unique 3 Tier Wedding cake on the special occasion will make your dr..
Love is running through your veins and exploding in your heart; show that loved one the way to your ..
Heart Shape Cake is Available for Many Type of Design and Flavour Online Cake Delivery in Noida,Delh..